and are on a touring holiday of Italy. 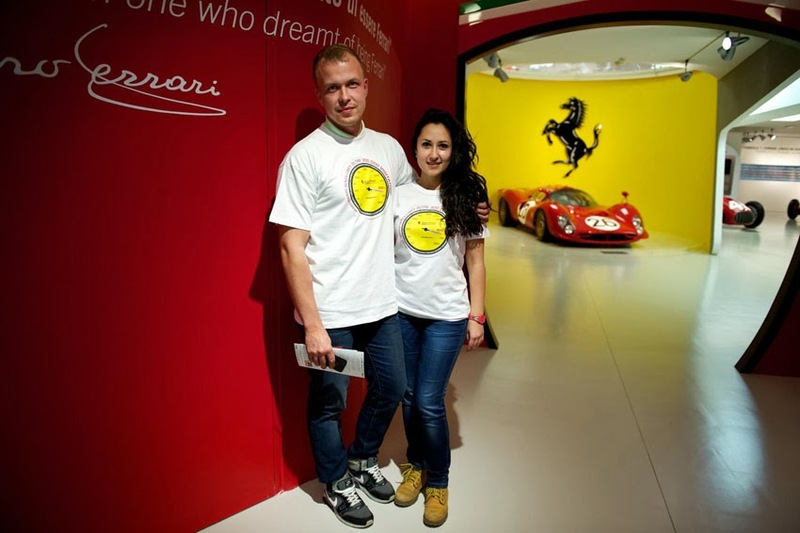 "We have visited a lot of cities and decided to also come to Maranello to visit the Ferrari Museum, which we found out about on the Internet," said the young woman, in a mixture of English with a few words of Italian. "It's been a great surprise to be received in such a special way, we couldn't believe it!" For Yuriy, this visit was the realisation of a dream to finally see Ferraris at first hand, "At home I have a collection of Ferrari model cars which I have been making ever since I was little and it's really special to be here and visit this fantastic Museum." Yuliya and Yuriy were given a great reception by the Museum staff, led by its Director, Antonio Ghini. The Petersburg couple were presented with commemorative T-shirts, featuring a Ferrari rev-counter, showing the speed passing the 300,000 mark… of visitors and they wore them proudly during the visit. The three hundred thousand visitors per year mark is very significant and confirms that the Maranello facility is one of the most visited in Italy. The increase in visitors over the past years - going from just over 220,000 in 2011 to 250,000 last year - confirms that the work carried out, by increasing the permanent collections and creating a packed programme of themed displays, such as Ferrari Sporting Spirit, which allows people the opportunity to see the latest beauties produced at Maranello alongside extremely rare models, is going in the right direction.